Milton Glaser Is Famous for the ‘I Love New York’ Logo. How Did He Do With Rhode Island? Rhode Island has unveiled a new logo from Milton Glaser, the designer behind New York's iconic "I Love New York" identity, as part of the state's new tourism campaign from Havas. The new brand mark, a simple sail, is meant to capture the essence of the Ocean State. 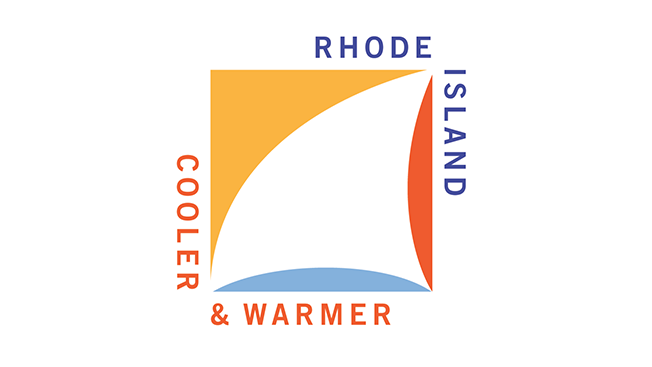 The campaign, which is part of the state government's effort to boost its local economy, has also rolled out a new slogan, "Rhode Island: Cooler and Warmer," and website. "When I did the 'I Love New York' identity I had no idea it would be so durable," said Glaser. "One of the reasons it's durable, curiously, is that it makes people feel good when they look at it. So here I was trying to do that in effect by creating a sense of pleasure with the association with Rhode Island." Glaser added: "What seems to be obvious is that you can't deny the intrinsic quality of the place—in this case the idea of water, sailing and the blue sky—is really characteristic of your experience [of Rhode Island]. I was trying to amplify something that people experience as truthful when they went there and also in a way that's memorable, which is to say that once you see it, it doesn't look like all other sails. It looks different by virtue of its form and the arrangement of colors." According to Rhode Island Commerce Corporation chief marketing officer Betsy Wall, the state tapped Glaser because it wanted some "inspired design brought to this. We weren't just looking for some corporate logo that—nothing against anonymous art directors—but that an anonymous art director was doing at their computer, but something that really spoke to Rhode Island's passion for design, nautical history and history of original thought. We wanted to make sure the mark reflected that. "The Milton Glaser art, that is not your typical state [logo]. If you look at what other states have on their websites, it isn't usually true art like that, it isn't usually so thought provoking and inspiring," added Wall. "I can't think of another state, besides obviously New York, that would think to bring in somebody like Milton Glaser. This is a place where art and design are in the DNA." The state chose Havas to lead the creative work and social media for its new tourism campaign because the agency has deep roots in Rhode Island. It was founded there, and since winning the business it's opened a Rhode Island office, according to Wall. But some Rhode Island-based designers and marketers criticized the state's decision to outsource the work. @CommerceRI @RITourism I love Rhode Island. So much so, it pains me to see how truly, laughably bad this work is. Hire local next time? "I have respect for Glaser. But seeing the results of my state's efforts leaves me both underwhelmed and arrested," shared Newport, Rhode Island-based design shop Lakuna Design in a blog post. "Looking at this logo makes me feel like there is a hairline between legendary accomplishment and amateur obscurity. Honestly, down here, I feel like I'd be out of business if I offered up this kind of work. As a shape, it feels cheap, dated and unsophisticated. As a logomark, it lacks strength and versatility." Alec Beckett, creative partner at Providence-based ad agency Nail, believes the campaign is "solid" with one exception: the "Cooler and Warmer" tagline. "It violates a fundamental rule of marketing, which is if you want people to think your brand is cool, don't say your brand is cool," said Beckett. He added: "But rather than quibble with tactics, the bigger story here is that we are finally stepping up as a state and doing something. Rhode Island is really an amazing place to visit and live, but we've been all but invisible from a marketing standpoint. I know I'm not going to love every tactic, but I am thrilled that we are getting into the fight."